On November 19, 1703, one of History’s most celebrated prisoners died while still in prison, an unidentified man known to us as “The Man in the Iron Mask.” Ironically (even the word “ironically” is ironic in this case! ), the mask kept over the prisoner’s face was black velvet, not iron. The iron part of the story came from a work by Voltaire in 1771 when he claimed the mask was an iron one. Voltaire also claimed the man was an illegitimate brother of the French King, Louis XIV. 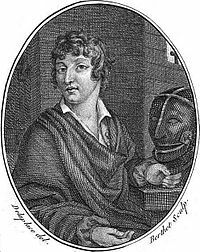 Novelist Alexandre Dumas (he of The Three Musketeers fame) later wrote his novel The Man in the Iron Mask in which he labeled the prisoner as the identical twin brother of Louis XIV. 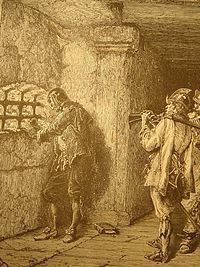 Arrested in 1669, the mystery prisoner was held in several different French prisons over time, including the Bastille. During his entire 34 years of incarceration, the prisoner was held by jailer Benigne Dauvergne de Saint-Mars, who apparently took the identity of the prisoner to his own grave. First mention of the prisoner dates from 1669 when Saint-Mars received notice a prisoner would arrive named “Eustache Dauger,” perhaps a pseudonym, and just maybe the poor man’s real name. Detailed instructions were included as to the layout of a special cell with double doors creating an “airlock” type of antechamber so that when leaving food and water or picking up used utensils no jailer would actually see the prisoner. The prisoner was ordered not to speak except about immediate needs or he would be executed immediately. Further, the prisoner was described as “only a valet,” kind of ridiculous considering the precautions taken! In 1681 when Lauzon was freed, Saint-Mars and his special prisoner moved to another prison. In 1687 another move was made, this time sparking rumors about a prisoner wearing an iron mask being transferred. In each prison the multiple door arrangement was made to preserve the secret identity of the prisoner. In 1698 another move was made, this time to the infamous Bastille in Paris. The mystery prisoner was reported to be wearing a mask of black velvet. When the prisoner died in 1703, he was quickly buried with the name “Marchioly” on his grave. The furnishings of his special cell were destroyed and the cell itself was scrubbed clean. For some reason every bit of metal the prisoner had owned was melted down. The identity of the mysterious man in the “iron” mask died with him and that secret identity was meant to be kept secret. Of course, speculation about the prisoner’s identity has raged ever since, with all sorts of possibilities put forth, usually including some sort of royalty, nobility, or connection to the throne. Was the mystery man the son of Oliver Cromwell? Was he a disgraced Marshal of France? Was he a Duke, or a secret twin of the King? The father of the King? How about a foreigner, such as the son of King Charles II of England or an Italian diplomat? Numerous books, both fiction and non-fiction, have addressed this mystery, the most famous being the novel by Alexandre Dumas. Or in fact, was he really Eustache Dauger after all? 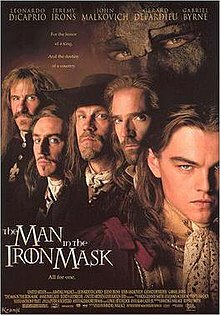 Popular culture has portrayed the “man in the iron mask” in numerous books, plays, movies and television shows. Even cartoons are not immune to the mysterious prisoner, as this character has been featured in such animated shows as Duck Tales and The Simpsons. GI Joe: The Rise of Cobra featured this character. Even rock songs have been made about or including the masked man! Question for students: Who was this guy? To have a reasonable opinion you would have to study an enormous amount of documents and correspondence from the era to attempt to put together an answer. With as much research as has gone into the subject, I would suspect the answer will never be known with any degree of confidence. If you have a good answer for us, please share that information, and why you think he is who you think he is. Dumas, Alexandre. The Man in the Iron Mask (Oxford World’s Classics). Oxford University Press, 2009. Wallace, Randall. The Man in the Iron Mask. MGM, 2006. Next Article History: November 20, 1861: US Civil War, Not so Civil, Kentucky Sort of Secedes!